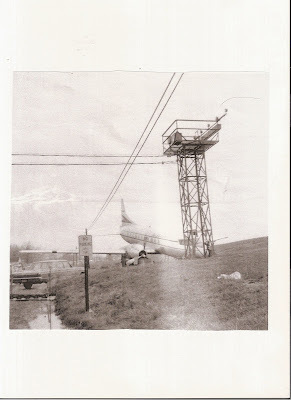 Allegheny Airlines Flight 305 Crash at Capital City Airport, New Cumberland, Pa. November 29, 1969. A friend of mine gave me copies of the photo’s of A Convair 340/440 from Allegheny Airlines. It over ran runway 26 at the Capitol City Airport, New Cumberland, Pa. On November 29, 1966. According to the accident report, Flight 305 had a complete electrical failure due to an improperly installed heater. The pilot decided to abort the takeoff, but the prop reverseve did not work. 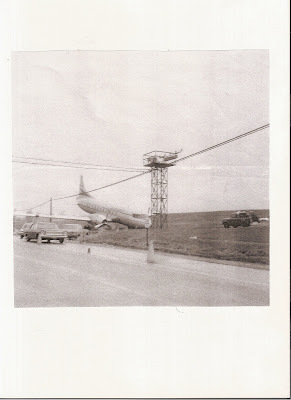 The Convair overran the runway and collided with an approach light tower. DISCLOSED SEVERAL CONDITIONS THAT WE CONSIDER HAZARDOUS TO FLIGHT. A NEARLY TOTAL FAILURE OF THE AIRCRAFT ELECTRICAL SYSTEM OCCURRED DURING THE TAKEOFF RUN OF ALLEGHENY FLIGHT 305 AT HARRISBURG, PENNSYLVANIA, ON NOVEMBER 29,1966. THE NOSE WHEEL COLLAPSED AND THE OUTBOARD FUEL TANK IN THE LEFT WINGWAS SLIGHTLY DAMAGED BUT RETAINED ITS FUEL. IT IS RECOMMENDED THAT ALL USERS OF CONVAIR 340,440 AND 580 MODELS BE ALERTED TO THIS VARIATION IN ELECTRICAL COCKPIT HEATERS, THAT THE TERMINALS BE PROMINENTLY IDENTIFIED AND MANUAL INSTRUCTIONS CITE THE DIFFERENT TERMINAL CONFIGURATIONS WITH APPROPRIATE INSTALIATION INSTRUCTIONS. IT IS RECOMMENDED THAT THE CONVAIR 340,440 AND 580 AIRCRAFT HEATER CIRCUITS BE MODIFIED TO PROVIDE CIRCUIT PROTECTION THAT WILL OPEN UNDER THE MOST ADVERSE FAULT CONDITION BEFORE THE FEEDER LIMITER OPENS. DURING THE INVESTIGATION, TWO MAINTENANCE ITEMS WERE NOTED WHICH WE BELIEVE ARE WORTHY OF YOUR ATTENTION. WHILE EXAMINING THE AIRCRAFT, LOOSE NUTS, SCREWS, DRILL SHAVINGS AND TRASH WERE FOUND INSIDE OF THE CIRCUIT BREAKER PANEL COMPARTMENT. ALSO, IT WA3-REVEALED THAT NO FUNCTIONAL TESTS WERE PERFORMED ON THE HEATER AFTER ITS INSTALLATION BEFORE RELEASING THE AIRCRAFT FOR PASSENGER SERVICE. ALLEGHENY AIRLINES HAS ISSUED FLIGHT CAMPAIGN DIRECTIVE NO. 88-103 WHICH REQUIRES THE FOLLOWING: 1. INSPECT ALL AIRCRAFT FOR PROPER HEATER INSTALLATION. REPLACE AND DESTROY ALL NONSTANDARD HEATERS. 2.. CHECK HEATER CIRCUIT BREAKERS FOR PROPER RATING. 3.. CHECK HEATER WIRING FOR CONFORMANCE TO HEATER WIRING DIAGRAMS. AN INSPECTION CARD CALLING FOR VACUUMING THIS COMPARTMENT EACH 300 HOURS.